We come together as one Domican Family today to celebrate not only Our Saints, but also our many Blesseds, Holy Friars, Nuns, sisters and Laity who have lived over the past 800 years. We are so priviledged to celebrate them as they provide us with an example by which we follow in our religious lives, by their wondorous fellowship in their communion and in their much needed aid to us by their intercessions to God on our behalf. We celebrate our thanks to God on this Important feast day for our Order and turn to the examples of our Saints, their lives and their intercessions for us so that they may guide us on our spiritual Dominican lifes journey. 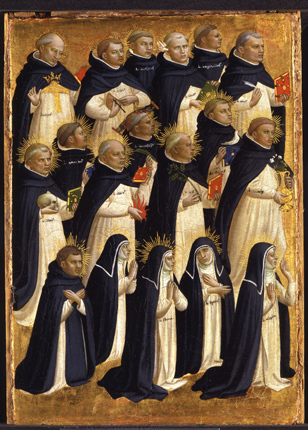 Our Order Father, Saint Dominic left us a wonderous legacy of teaching and preaching by word and example of how we should live our lives.It is, then, joyous and encouraging that so many of our Dominican brothers and sisters have been beatified and canonized.